Australian Eastern Standard Time is currently observed. 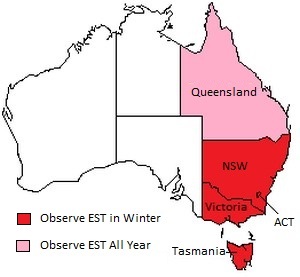 Australian Eastern Standard Time (AEST) is observed in Australia East Coast in winter. It starts 1st Sunday of April and ends 1st Sunday of October each year, spans through April, May, June, July, August, September. When it ends, Australian Eastern Daylight Time (AEDT) will be observed. • NSW, Victoria, Tasmania, ACT. Cities located in this time zone include Sydney, Newcastle, Canberra, Melbourne, Hobart, Brisbane etc. AEST starts at 3 AM on the first Sunday in April each year, turn the clock 1 hour back to 2 AM at that time. AEST ends at 2 AM on the first Sunday in October each year, turn the clock 1 hour forward to 3 AM at that time.